Celitron provides disposal systems for biological infectious waste, as well as sterilisation equipment, steam sterilisers and autoclaves, for hospitals, clinics and pharmaceutical companies. The company provides reliable, user-friendly and economical solutions to treat bio-infectious waste and contaminated reusable instruments, without emitting harmful substances. An R&D engineering team develops high-quality customised systems that are both safe to use and eco-friendly. 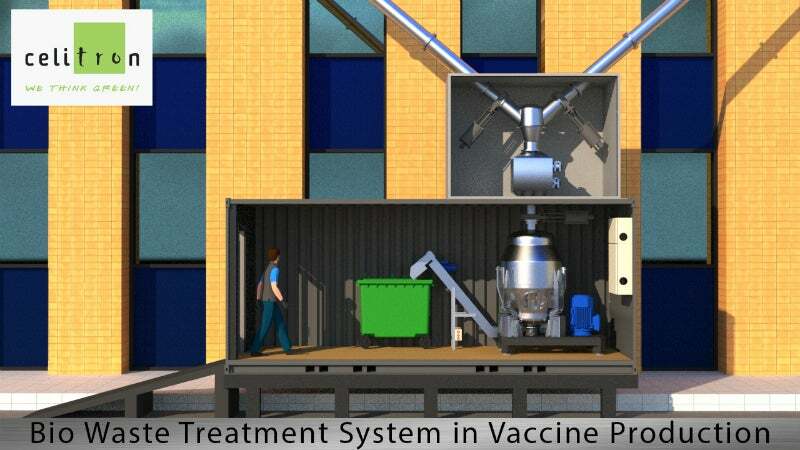 Celitron produces tailor-made systems for vaccine producers to convert biological infectious disposables, such as vaccines, human insulin, serums, plasma fractions and cell culture bottles. These systems only use steam as the sterilising agent. Due to direct connections to cleanrooms (where waste is generated), waste can be be disposed of immediately, eliminating the need for a specifc storage area for biological infectious disposables and removing cross-contamination risks. This integrated system provides automatic loading, unloading and compacting, as well as sterilisation and shredding in a single vessel. The treatment process can be started by an operator from the cleanroom. Contaminated disposables are automatically transferred through the sliding system to the compactor to reduce waste volume before it goes to the final sterilisation and shredding treatment. Compacted waste is automatically loaded on the Integrated Steriliser and Shredder (ISS), which is designed for on-site conversion of biohazardous waste. After treatment, waste is rendered, fragmented, and made non-toxic and solid to ensure it can be disposed as regular municipal waste, that is ready for recycling. The Integrated Steriliser and Shredder (ISS) complies with European Union (EU) and World Health Organisation (WHO) recommendations, and features a motor-driven shaft with shredding and crushing blades that can rotate in different directions to cut waste volume to 20%. Process waste items such as dialysers, syringes, papers, cloth, plastic and glass are cut up by shaft-mounted blades. Steam is produced by a steam generator, which has a standard connection to the water purification system and the drain. Sprinklers are inside the vessel for automatic cleaning. The complete process is automatic, includes door opening and closing, sterilisation vessel rotation to operating position, as well as sterilisation and shredding. After waste is treated in the Integrated Steriliser and Shredder (ISS), it is sterile, rendered and safe to be disposed as municipal waste. Several capacities are available according to individual client needs. Celitron has introduced its tailor-made biological infectious waste treatment system for vaccine production at the recent Disposable Solutions for Biomanufacturing Exhibition & Conference. Celitron offers integrated solutions to treat infectious plastic cell culture roller bottles. The system minimises the risk of cross-contamination, shortens waste handling process and reduces associated costs.